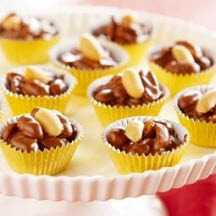 Clusters of lightly salted peanuts coated in a mixture of semisweet chocolate and white chips, with each cluster garnished with a single plain peanut. Place chocolate chips, white chips and shortening in small microwave-safe bowl. Microwave at HIGH (100%) 1 to 1 1/2 minutes or until chips are melted and mixture is smooth when stirred. Reserve 1/4 cup peanuts for garnish; stir remaining peanuts into chocolate mixture. Drop by teaspoons into 1-inch diameter candy papers; top each candy with a reserved peanut. Refrigerate, uncovered, until chocolate is set, about 1 hour. Store in airtight container in cool, dry place. Makes about 3 dozen candies. Recipe and photograph courtesy of the Hershey Kitchens, and reprinted with permission of The Hershey Company. © The Hershey Company.